I wanted to look as thin as possible for my wedding. Truth be told, I'm very insecure about my body and never feel I look skinny enough. Everyone has their own opinion in what they think looks good and how they look, and the skinnier I look, the happier I feel to be honest. Though I still didn't completely like how my body looked, I worked very hard to get it as good as it could be. Genetics are NOT on my side when it comes to my weight and if I'm not careful, I gain weight really easily. I specifically picked a long sleeve wedding dress because my arms are probably my biggest body insecurity. If I had the money, I would have went for a Sculpsure or Coolsculpting treatment on them before the big day, but unfortunately budget didn't allow it. I do still want these treatments eventually. I usually work out five to six days a week making sure to have at least one day rest for recovery. I do a mix of weight lifting with some cardio and yoga/stretching for flexibility. I've been working out consistently for over a decade now doing Beachbody Programs. Honestly, my body does not look as tone as it should for how hard I work out which is frustrating. I am not a Coach (aka someone who tries to sell the Beachbody stuff) but I love their On Demand streaming service because it is easy access to all of the different programs. I work out at home also since I am too insecure to work out at a public gym with other people around. I have a set of the adjustable Bowflex SelectTech weights that go from 5 to 52lbs. I got those in 2009 and they were one of the best purchases of my life. For the wedding, and since January I've been doing a Beachbody program called 80 Day Obsession. The only main thing that changed with the wedding coming up was that I made sure to not miss any work outs. I already am regimented and very rarely will miss a weight lifting day, but I took it to the next level, not even allowing myself to skip a cardio session where sometimes if I had a lot going on I may miss it. The real challenge with myself and exercise is sometimes due to health issues that I won't further discuss, my body isn't always willing to do what my brain wants. I always push 100% though and do not make excuses. Some say I push even harder than I should with it. I struggle so much more with food than I do with doing my work outs. I love food and if I ever had a genie grant three wishes, the first would be to eat what I want without gaining weight. I actually have a certification from a holistic nutrition school and know a ton about healthy eating, various diets, etc. I usually follow a "80/20" rule eating very well 80% of the time and allowing 20% of the time for craving and enjoyment because food is one of life's greatest pleasures. For the months leading up to the wedding that ratio went to "90/10" and then the few weeks before went to "95/5" The weeks before were torture, I won't lie. My family ate pizza in front of me three days before the wedding and it was miserable not partaking since pizza is one of my favorite things in life. But I knew my wedding pictures would outlast the taste of that one pizza so my willpower stayed strong. I did eat pizza the day after the wedding. Portions are everything and super important to look at, even with healthy foods. The weeks before the wedding I didn't even have my after dinner sweet that I enjoy (some days it can be as small as a Hershey Kiss.) I also always drink a ton of water so kept up with that. I don't believe in starving myself so make no mistake, I did eat before the wedding- I had to in order to properly fuel my work outs and not feel terrible. I just ate really, really boring and clean. I minimized carbohydrates but didn't give them up completely because personally I don't believe in a no carb approach to eating. Like fitness, I keep up with a really good skincare regimen always so I wasn't planning on doing much differently. For the past year, I was only using Emme Diane products and I was using them up until a little after the wedding. 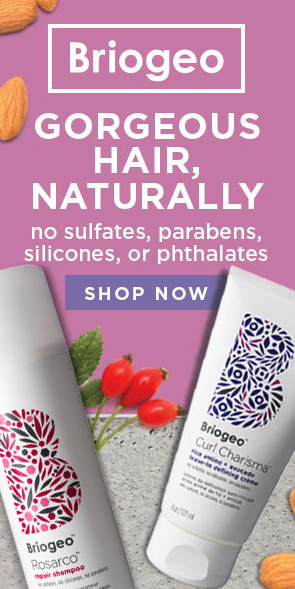 Currently I started using other products now, but that's a whole different blog post. I ice my skin twice a day after cleansing before all my other products. It is a free tip Emme Diane taught me and has such a huge impact on the condition of my skin. I have combination, adult acne prone skin. A few weeks before the wedding, due to the stress, I had the worst acne episode since I was a teenager. It was BAD. I will not show a picture publicly, but the few close friends I did show it to couldn't even believe that was my skin. Emme tweaked my routine a little bit and I also went for a facial the week it happened and the week of the wedding. Even my facialist asked me what happened because she never saw my skin look so bad. Additionally, the week of the outbreak I ran to my dermatologist. He gave me prescription stuff to add in to my regimen to fight the break outs and I also made an appointment the Friday before our Sunday Wedding just in case any zits popped up I needed extracted. Luckily, I was able to cancel that last appointment. 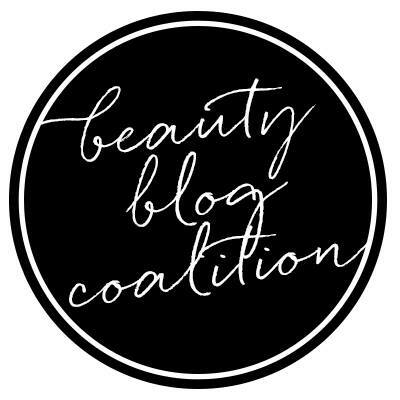 Between the facial, the tweaks in my routine and the prescription products, the acne calmed down but the stuff from the dermatologist was so strong I started getting dry, tight flaky skin! Ugh!!!! I'd take the dry flaky over the ugly, red pimples. By the wedding day, I only had minor dry patches that were undetectable in photos, thankfully. Something else for my skin I use is the NuFace Microcurrent Device. I have been using this since I got it in 2013. I just did an updated review HERE. For the wedding, I used it every single day for the weeks prior, where I usually just up it anywhere from 3 to 5 days a week, and I also did longer sessions holding it on my double chin and below my cheekbones longer to achieve the optimum sculpting effect. I even made sure to use it the morning of my wedding! This is my favorite beauty tool and I can't be without it. I hired a makeup artist because while I'm okay at my own makeup, by no means am I a professional and when I did my own makeup for my Engagement Photo Shoot (see that post HERE), my nerves got the best of me and I had to redo it three times. My makeup artist, Caitlin (@hmua_caitlinalyce), is super sweet and talented. My hair stylist, Sage, introduced us. 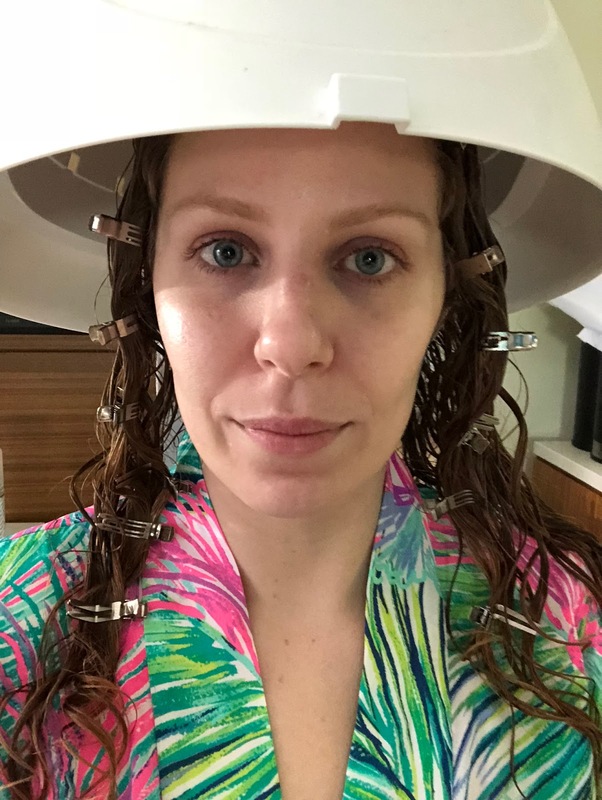 I had Caitlin do my trial for my Bachelorette Party (see that post HERE) and loved it. I knew I was in good hands. We used a mix of products from her kit and some of my personal favorites. She used a lot of theatrical makeup on me since I am shine prone and wanted to look matte and have it last all night, even through the rain. I didn't get the names of those products. 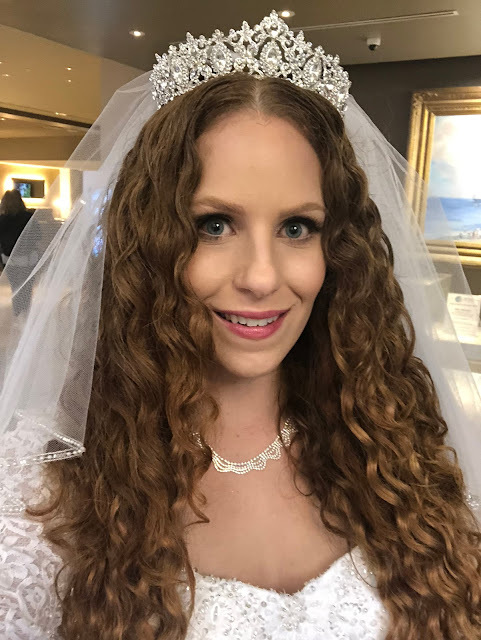 I knew I wanted to wear my hair down and curly for my wedding. 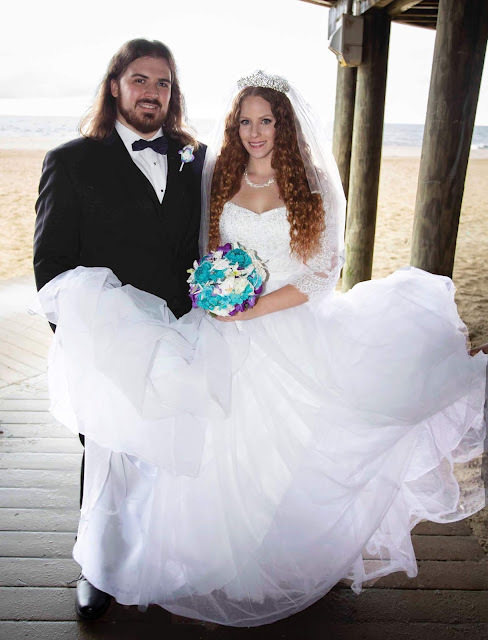 This was based on two things: 1) I hate how my hair looks up and 2) It almost never stays when blown out, especially in rain, and I just KNEW it was going to rain on my wedding day. I also knew I wanted a wedding veil and tiara to complete my look. It was so important for my hair to look decent on my wedding day. I always wanted super long princess hair for my wedding but didn't think it would be long enough since I'm still in the middle of growing it out. 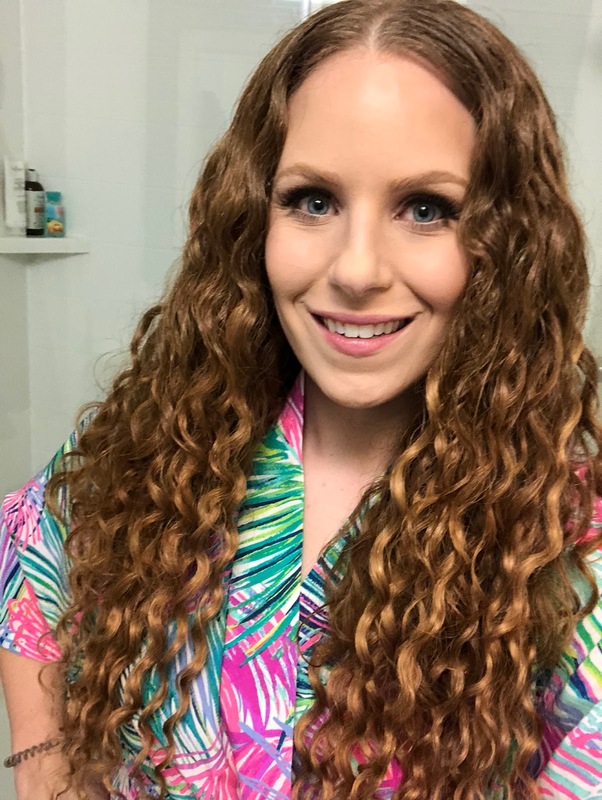 I came across curly hair clip in extensions from Curls by Bebonia and they were a dream come true! I met with the owner, Soleil, in Manhattan a couple of weeks before the wedding since my hair color and texture are both difficult. We wanted to make sure the set she picked for me matched my hair and they did! The color is slightly lighter, but it blended so well. The extensions were the only thing in the wedding I went over budget on and I regret nothing. They were worth every penny because they completed my look and made me feel that much better about myself. 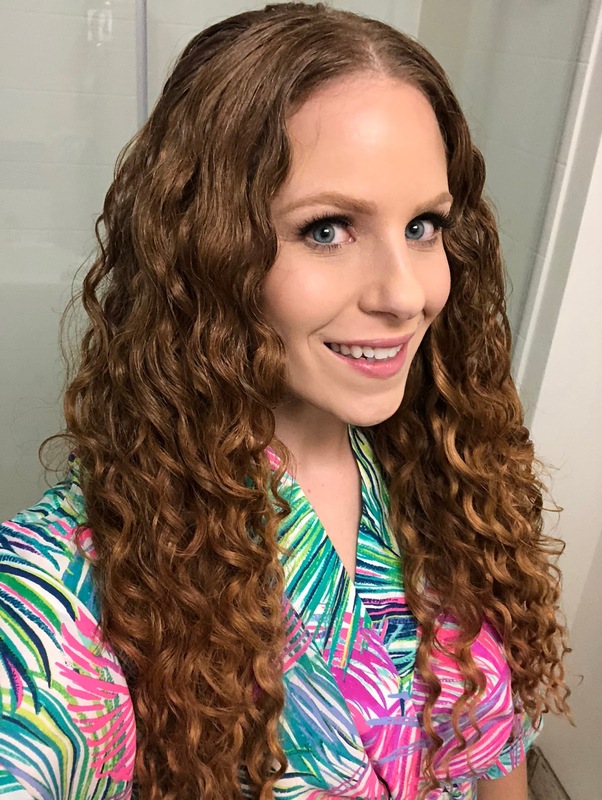 They helped me achieve my dream wedding hair, plus I can rewear them when I figure out how to use them myself! If you are familiar with my blog, you know my upkeep with my hair is detailed and some may say "extra" at all times. I keep up with deep conditioner every wash, protein treatments every 2 weeks, Olaplex weekly and trims every 3-4 months. That did not change for the wedding. 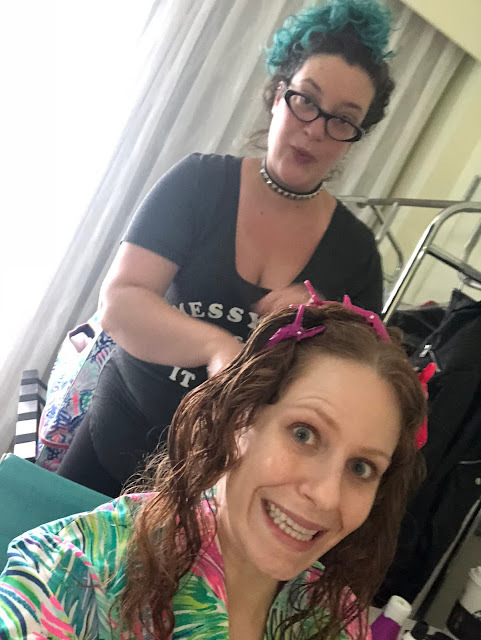 Here is what I did to make sure my hair looked the best it can for the day of the wedding, as well as a lot of the products used. The night before the wedding I slept with Olaplex 1 and 2 in my hair. I woke up and cleansed with the Curlsmith Curl Quenching Conditioning Wash.
After rinsing the co-wash, I applied Briogeo Don't Despair, Repair Deep Conditioning Mask and left it on my hair until Sage arrived. Sage (@hairbysage_) has been doing my hair for months. She is my stylist and a good friend. She's styled and set my curls many times so I knew that she knew them. The week before the wedding, we did a trial with the extensions so she'd get a feel for them and know what to do for the big day. She set my hair and then sat me under the hooded dryer for a while. After that, she diffused while Caitlin continued my makeup. My hair takes forever to dry, even with a blowdryer. We used a TON of styling products. Sage went very heavy handed to make sure my hair didn't pouf out all night and we also had to protect it from that damn rain. She did use some stuff from her own kit, but for the most part she used my favorite products including Jessicurl Too Shea! 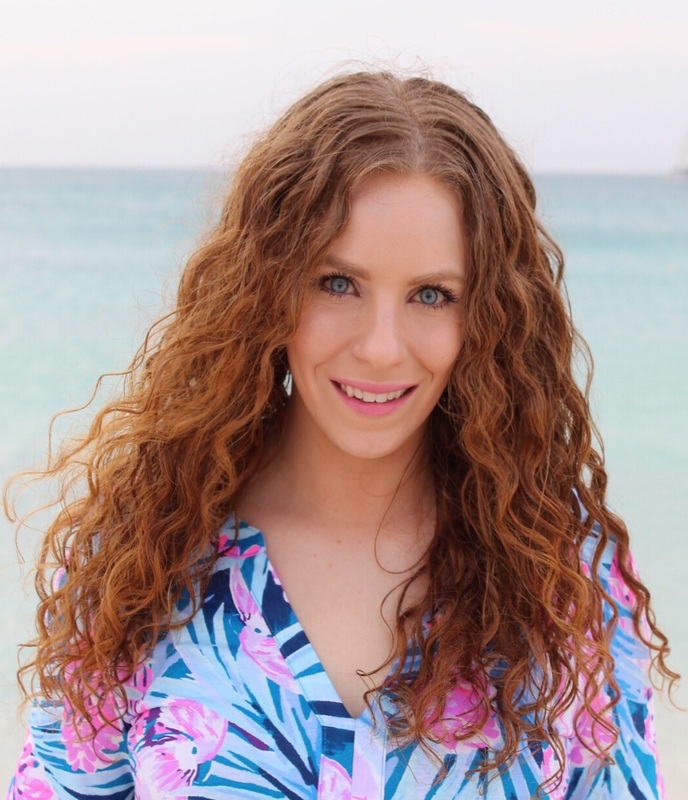 Conditioner, Raw Curls Anti-Frizz Spray, Jessicurl Rockin' Ringlets, Raw Curls Firm Hold Gel, Jessicurl Oil Blend and upcoming hairspray. For heat protection with the diffuser, we used the IGK Good Behavior Spirulina Protein Smoothing Spray. Since my hairline pieces drive my nuts, I clipped them down to help stretch them out and shape them better. Those are the beauty details from my wedding day! For information about the venue, how we budgeted, the dress, decorations, pictures and so much more check out that blog post HERE.